I saw you're online in the Members Online list. Are you the Adamant user from pocketmonsters.net? Happy 10th anniversary on the Serebii forums! Adamant what happened to te data broadcast that was meant to be updated around now for July-September? On the offical site it says that they have updated the data broadcast on the 2nd July. Giving a "can to translate· to see if a character appears in this episode from the scan above is not "doing missense". Neither is comparing to similar incidents. When I saw who posted in Bulbagarden and saw Diantha I wonder who out her name here. And when i find out it was G50 i suspected that it comes from a magazine. However I didn't remember where. However, remembering and remembering, I finally remember the possible scan. And what i did is posted the scan for translate, explained what happened to that scan (people speculating about Ayaka being int he anime; when you (and I) know is because the movie) and find out that Diantha appeared in that episode. And later I said "there's was a precedent with Meloetts 1st appearance" in the show because I knew the entire storyline. -Meloetta was scheduled to appear in une 21st in BWII 1. -Dengeki posted an scan saying that meloetta eill debut in June 7th. No other magazine mentioned it. -A VA list appear with meloetta in. You didn't believe it at first and you thought it was a post episode segment. -An the Sunday before the episode airs, Meloetta was shown in the Smash previewmeanign that Meloetta willa ctually appear. 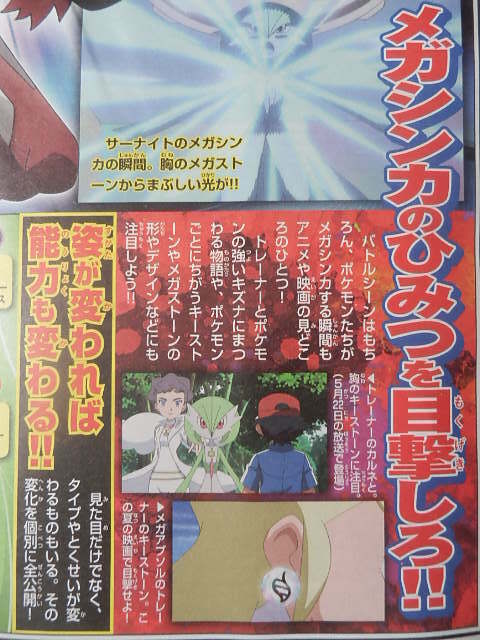 The similarities is that an alone magazine (Famitsu) indicates "Pokemon trainer Diantha..... on May 22nd". I send the magazine to translate for seeing why the magazine indicates May 22th* (The date of the Bonnie and Dedenne episode). * The ates of the Famitsu magaine aren't done before XY24 was delayed. I indicated it. okay; kansai-ben o benkyo shite. tazuneta riyuudosu. jimaku o koshiraeru nodosu kai? So it sounds pretty much like what she's already said in that interview on the movie's website then. OK.
Did you happen to catch Pokemon Smash on Sunday? Takashima Reiko was supposed to make an appearance and I'm curious how that went. Aye. I do wish GameFreak would stop making unneeded new formes though. I personally do believe that the image is fake, but it if turns out to be real, I wouldn't really mind. I personally wouldn't be a huge fan of it, but it's something that would entirely be out of my control so there'd be no point in getting my knickers in a twist about it.